There are a number of different types of water and space heater designed for motorhomes. Some just heat water, some just the air, and some are 'combination' and do both. They may work on diesel, or gas, or mains electric, or a combination. A good motorhome show is the place to go to see them all and compare, although not all models are available to self-builders. Originally, we looked at using the Truma combination boiler; this heats water and blows out warm air through a duct system. Unfortunately, when we designed the sofabed, we concentrated on the overall height of the sofa for comfort - but we did not pay sufficient attention to the internal height of the sofa base and whether there would be enough room to fit the Truma heater - it was too tall. The Propex Malaga water heater would fit - just! However, the Malaga is only a water heater, it does not provide warm air heating. To locate a Truma water heater to another location in the van, say the wardrobe area, was not an option; access for maintenance would be difficult, the hot water pipes would have been overlong, and the warm air-duct run and outlet location would have proved problematic. 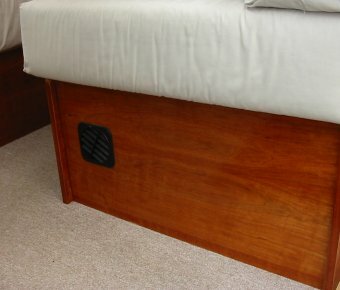 The heater location in the sofa bed box meant the pipes to the shower/wash basin and kitchen sink are kept short, saving on the amount of water often wasted whilst one waited for hot water to reach the taps. The location of the external flue also has to be considered as this must be at least 300mm from an opening window and 600mm from a vertical corner. For reasons mentioned above we chose the Propex Malaga 3E storage water heater. This works on gas and/or 230v AC mains supply. The unit can store 13.5 litres of hot water. 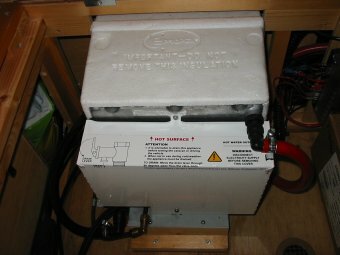 A 12 volt dc supply is required for the heater control, but current consumption is low (0.36Amp). In our experience it takes about 18-20 minutes to heat the water to a very hot temperature when used on both gas and electric, and around 30-35 minutes on gas alone. 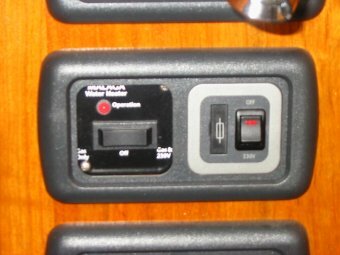 The heater is supplied with a wiring harness terminated at one end with a control panel - a small black-painted plate fitted with a 3-position switch and led light (shown on the left of the pic), and a small connector for the heater end. Regrettably, the plate would not fit into a CBE type plastic bezel, but is attached with two screws - we managed to fit it behind a bezel to keep the appearance as other switches etc. Update. Later version of the heater has a control plate that does fit in a CBE bezel. In the pic the 5 amp double-pole switch and combined fuseholder on the right are for isolating the 230v. AC mains supply to the heater. The Malaga heater has an external flue and this requires a hole cut in the van side wall. 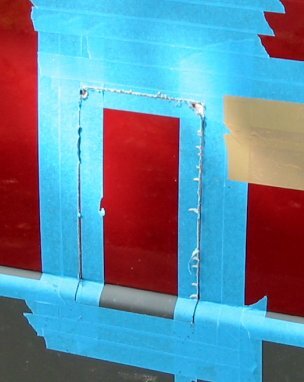 Much to our annoyance, having fitted the heater inside the sofa bed box as high up as possible and prepared to cut the hole for the flue, we found the lower lip of the flue moulding would not clear the van external plastic moulding - so this moulding had to be cut. As mentioned above the flue must be sited away from opening windows, see Sources for Manufacturers website. As the van side panel is also curved, strips of hardwood were used with Sikaflex sealant to bed the flue satisfactorily. As shown in the pic the Propex flue is coloured black - this was our doing - not wanting the stark white moulding as supplied. At the heater end, we fitted a rubber mains connector to the very short mains flexible cable supplied with the heater - this to allow easy removal for maintenance. We could have used a surface mounted double-pole switched 13amp socket and fitted a plug (with 5amp fuse), or a double-pole fused spur box, but the combined connector and 5amp switch on the main panel is a more elegant solution, in our opinion. The mains cable between the heater and control panel switch was run in flexible conduit fixed in place with clips and cable ties. The hot and cold water outlet pipes use a 12mm push-fit type connector with worm-drive clip to attach the piping. Note, there are limitations on the type of pipe used at the hot water outlet. The gas connection is 8mm. Note the drop-out hole for gas safety. We understand the Malaga water heater has recently been redesigned and is now also marketed under the Whale name. 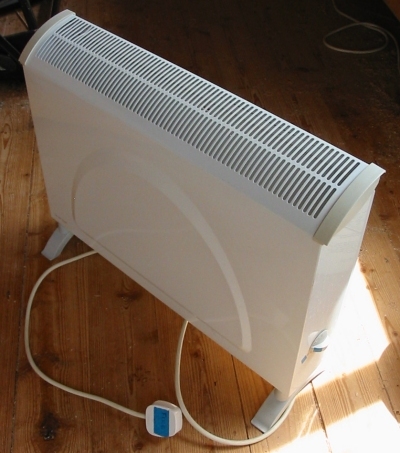 The new heater has a distinctive blue-coloured cover and black insulation, but looks very similar to the old Malaga and is very probably a direct replacement. The Propex model still appears to be available. 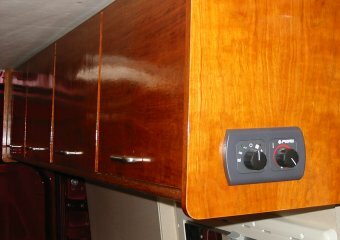 As mentioned at the start there are various designs of heater for motorhomes; these work on diesel, gas, electric or a combination. It depends on one's lifestyle which is the most suitable. Please, keep safe and never, ever, use a gas hob, or any heater with a flame that is not specifically designed for use inside a motorhome to heat the interior. Although we have permanent ventilation, we always open a roofvent a few inches for ventilation when cooking or using any heater. Using Mains Hook-up. Temporary or Permanent Solution. For a couple of years, when we were out and about in the spring or autumn, invariably we would go to sites which had electric hook-up and use a portable fan heater to heat the interior in the evening and first thing in the morning. However, a fan heater is rather noisy and possibly not safe left on overnight in the confines of a motorhome. One Christmas we used an inexpensive 2kw electric convector heater (borrowed from the shed) to heat the van when staying in the garden at a relative's house. This was an excellent solution; it kept the van warm overnight at 14-18 deg C. with snow outside, and it made no noise apart from the odd 'click' when the thermostat operated. And, of course, our relative was paying the electric bill - and why not, we are just a couple of pensioners! A drawback with the B&Q heater is its size (and some may say it's not elegant to look at), but we stored it in the toilet compartment when travelling - it did the job - but it is not a permanent solution. 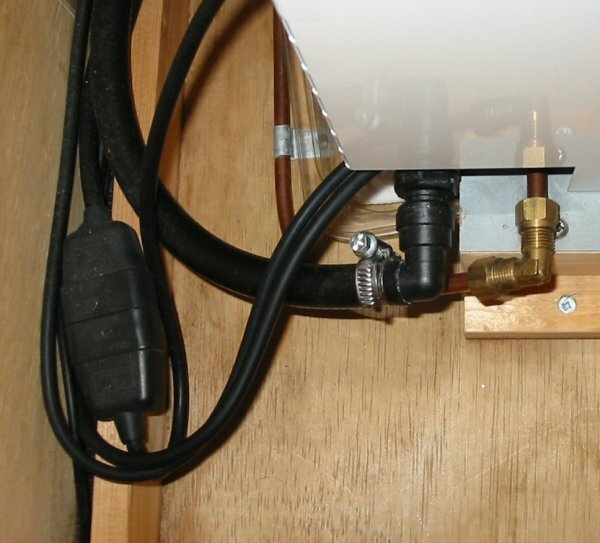 It also requires 8 amps when on 2kw setting, see below. We did try a portable electric 1.5kw oil-filled convector radiator fire, but this did not seem to be as effective as the convector fire - perhaps that 0.5kw difference in output really did matter. 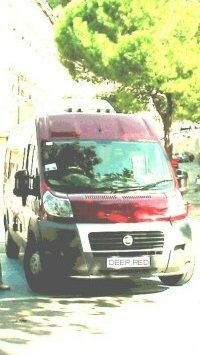 If we wanted to use the van on a French Aire, where there is often no electric, then we'd have to think of either a gas or diesel fuel heater. For our 'winter sun' trip we decided we ought to have our own gas heater, just in case a campsite was closed, or electric wasn't available, or too low in amperage. Some sites in Spain are 4amp, which is a bit near the bone for even a 1kw heater. Having decided to use gas for water and space heating, the very popular Propex Heatsource 2kw space heater seemed a good choice. However, this heater has recently been redesigned and can now operate on gas and mains electric, which made it an even better bet, in our view. It looked ideal - until we asked the price from the manufacturer - £700. Gulp! So we shopped around - the best price we got was £600, from Rainbow Conversions (see Sources for details). Before we made any purchase we thought it a good idea to check if this heater would actually fit in any of our bed/seat lockers. From the dimensions we had this new elec/gas heater looked much longer than the old gas-only version. So we made a card template with all the holes marked where the flue pipes go through the floor. 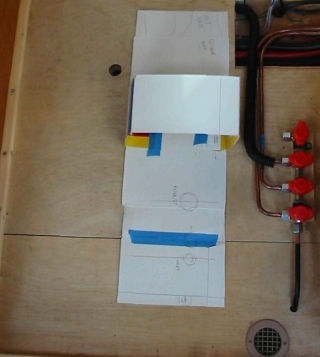 It turned out to be a challenging proposition as one has to consider not just the bulk of the heater, but the output ducting has to be added on the length, plus a bit for the gas pipe at the other end. Furthermore the two flue pipes that exit directly under the heater and through the van floor have to clear any obstructions. In our case: the underslung fresh water tank and the van chassis. These flue pipes make life difficult. 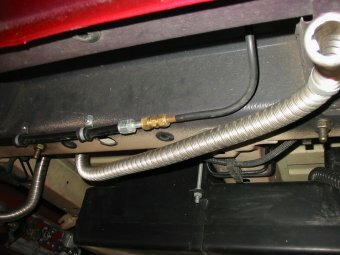 They limit where the heater can be fitted, as not only are the pipes limited in length, but there are restrictions on where the ends may terminate under the vehicle. 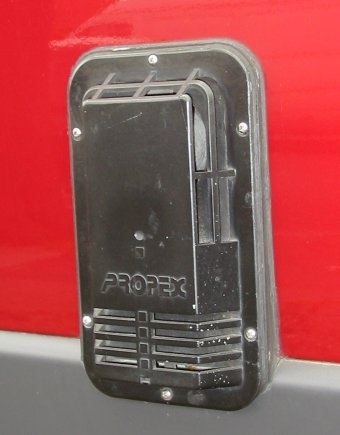 We would recommend one has a good read of the Propex Installation Instructions (see Sources page for link to Propex website) before purchase as the limitations may make this heater unsuitable for your van or, at the very least, void the Propex warranty if one did not conform fully. 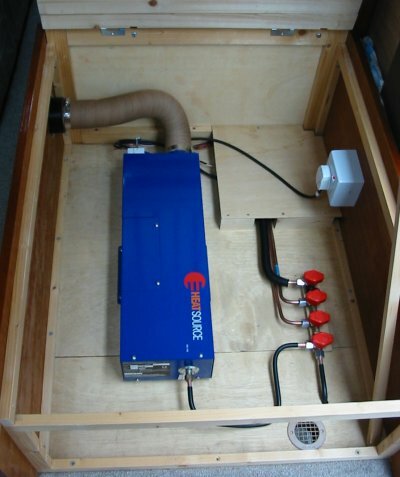 We would have liked to have installed the heater in the long sofa bed box, however, the length of the heater and ducting would not fit into the space we had, so it went into the small seat/bed box. There is just one warm air outlet - this is sufficient for our needs although one has to leave the toilet/shower compartment door ajar to warm up that space in the mornings. There is no way we can see of fitting a second outlet in the toilet compartment as crossing the 'corridor' between the seat box, where the heater is, and the toilet is not an option. Update. The Whale version of this heater (see below), which appears identical in all respects (except the colour! ), offers an underfloor casing option. I'm not sure this would have helped us as 'free space' under our van floor is almost non-existant, but the possibility to fit the heater below the floor is there (although the Whale website suggests this underfloor heater is not available to self-builders). The cold air inlet vent is fitted in the front panel of the seat box. We cannot fit any ducting to this inlet vent as the panel pulls out to use the bed, but we do not see this as a problem as the inlet on the heater is not obstructed. Update. This is about to change as we are going to raise the fridge off the floor and the space beneath it will allow the heater air inlet and duct to fit in a new fascia below the fridge. 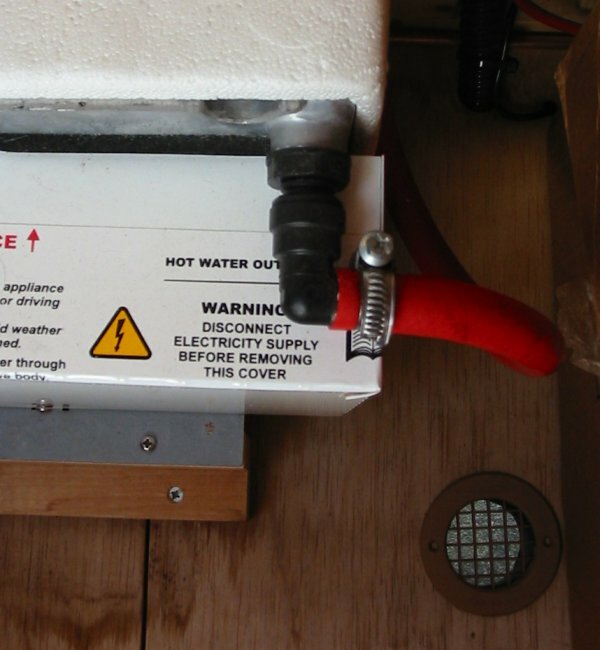 The space heater controls are connected to the heater with a cable harness that has connectors fitted at both ends. These connectors are quite large and where the cable harness is run through partitions fairly large holes are required. The panel is fitted at about 1.5m above the floor as this panel includes the room thermostat. There are three heat settings when running on electric, plus one fan setting (just that - a fan blowing ambient air with no heat) and one gas setting. The fan runs at reduced speed when on low (500w) and medium (1000w), and full blast on 2kw. When running on gas the fan runs only at full speed. The heater is supplied with a 13amp fused plug and requires a double-pole 13amp switched socket outlet. The heater can take up to 9amps when running on mains electric. The heater also requires a 12 volt d.c. supply from the van leisure battery. Max. 2.2 amps on electric, and 1.7 amps when running on gas. A 5amp fuse is fitted in the 12volt distribution fuse box. The heater also incorporates a low frost setting, which, we assume, is the '0.01amps standby' current draw specified on the battery. It is worth bearing in mind that 1.7 amps is quite a drain on the leisure battery when the heater is running on gas. If running on gas for long periods suggests there probably isn't mains hook-up available, so any charge to the leisure battery will have to come from the solar panels or by running the engine. As it will be cold outside, the battery drain is offset to a degree by the compressor fridge drawing less current. There is also a version of the Propex Heatsouce heater marketed by Whale; the Whale heater is painted a distinctive red colour. This Whale item appears to be very similar and probably a direct replacement for the Propex heater. It appears the Propex version is still available. In the limited period we have used the heater we have found it effective first thing in the morning when running on the electric 2kw setting. The temperature in the van would increase from around 10 deg C. to 18-20 deg C. in about 20 minutes. The gas setting (quoted as 2kw) seemed to take a little longer. This, of course, dependent on the temperature outside. We have slept a few times overnight with the heater using gas only. Although the fan running at full speed is fairly loud one soon becomes used to it. On these occasions the outside temperature didn't drop below about 5-7 degrees C. The heater only ran for approximately 15-20 minutes total in each hour to maintain roughly 16-18 deg. C. temperature inside the van. See the Gas section for details on our gas consumption.